I was browsing various online digi galleries the other day and I was so amazed with the elements they are using particularly the tied ribbon wrappers. Love it so much that I look for the designer. I found out that it was made and sold my Christina Renee and so I immediately googled and search where she is selling those lovely ribbons. The search led me to her own website and in no time I was glued to her site and could not resist in buying these ribbons. What more exciting is that it was on sale which is less 30% off. I got the ribbon for only $2.09 and I am very very happy. This is my VERY FIRST purchase hahaha…. I love her ribbons and I hope I can buy also some of her grungy papers.. ahhhhh Im actually controlling myself. I also wanted to buy some elements from Amy Martin, Gina Miller or Michelle Coleman. Just love these great designers. 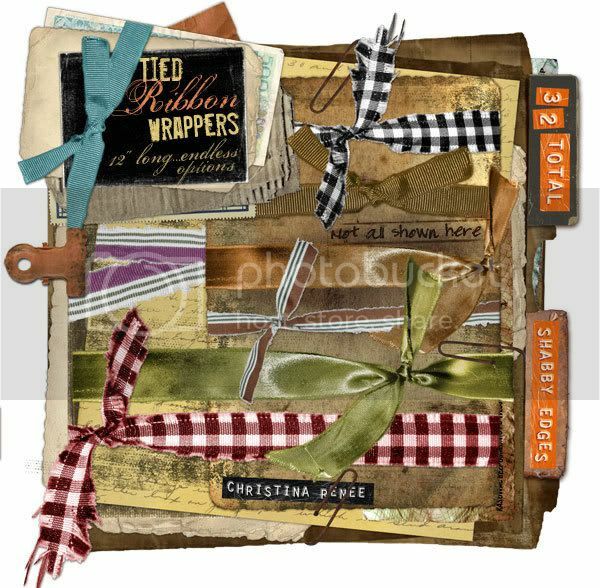 I am actually keen on scrapping lately and with my new purchase I know I will be more inspired… I will some layouts using this gorgeous ribbons soon. Love these ribbons!!!!!! Catch the sale at her shoppe.